YouTube issues as of Sept. 2018! Here is some feedback to the black unavailable screen. Google recommends that we (school districts) do NOT allow You Tube at all and suggests that we block it. However GSD thinks otherwise and does want it open. So keep in mind that we are working to keep it fully functionable above what other districts and google recommends. We have set is a moderate filter based on what the owner/supplier of the video has tagged the video as - we have no control over that. We are NOT sure why the "Black Screen" is coming up on some videos if you are NOT logged in. That is baffling us! 1. Teachers if you get the black screen that says Video unavailable - you need to click the blue SIGN IN button at the top right and sign in with your @granitesd.org account. The video should now play FOR YOU. 2. IF you want students to watch the video YOU MUST approve the video in the blue box on the next screen. If students get to a Video that is not "Available" or not approve. You will need to "approve it"... OR NOT - you make the call! Here are some creative EDUCATIONAL ways to use YouTube in the classroom. You can also go the TheOlyCenter channel at https://www.youtube.com/user/TheOlyCenter for some of my links, channels and playlists. 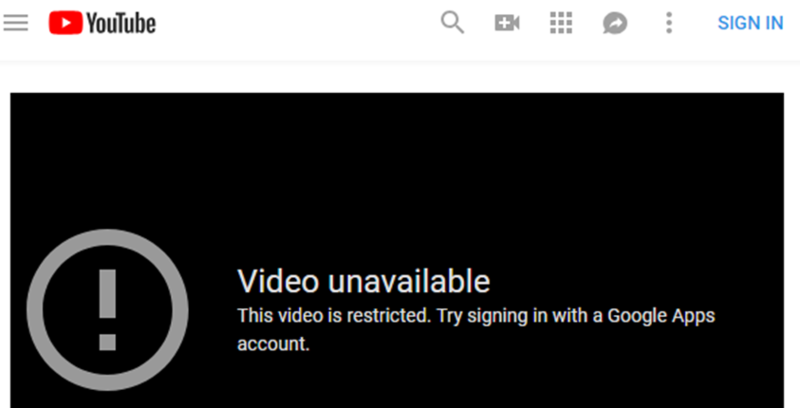 Google owns YouTube. That means you have an account there and can log in with your GraniteSD account and build your own channel and playlists. Put YouTube videos in projects that you build for class. However you are better off "downloading" the video with something like zamzar file conversion (In case it gets blocked you'll still "have" the video.) Google will help you find many other options. Save videos to your M Drive, for future use. Some channels or videos may get blocked due to rated content of individual videos. Create your own channel or playlist for school. Playlists would be a great idea for different class topics and/or subjects. Upload your own videos for use in class/school. Use your @granitesd account. USE HEADPHONES or mute it while in any computer labs. Teachers can use LanSchool to mute all the computers if needed. Teachers should not send kids to youtube. You should embed the youtube video in your canvas pages if you have videos for your students to watch. On top of all else - Please be advised that just because you saw it on YouTube does not make it a reliable source! Here are some cool videos of things that are just NOT TRUE.